In his appearance yesterday on 60 Minutes, Amazon CEO Jeff Bezos acknowledged that the company sells its Kindle Fire tablets at cost. 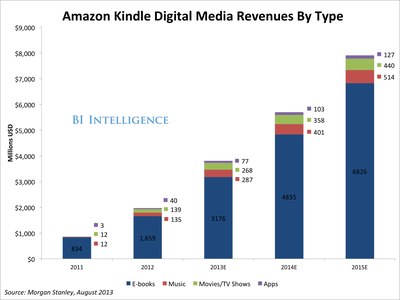 Instead of squeezing a margin from its hardware sales, Amazon generates revenue from Kindle Fire users in other ways. It encourages them to download from Amazon's vast digital library of apps and media, view ads, and access related services like e-commerce. In a new report from BI Intelligence, we dig into available data on Amazon's unique mobile strategy. Amazon has achieved respectable results in terms of app downloads and app revenue on Kindle Fires, and yet is often left out of mobile platform analyses that focus on Apple, Google, and Microsoft. The Kindle has not managed to achieve real scale globally: The Kindle line, including e-readers, took only a 2% share of global tablet shipments in the third quarter of this year, according to BI Intelligence estimates. That share will bounce back in the fourth quarter, since Kindle sales are strongly influenced by holiday gift-giving. However, due to competition from low-priced Android tablets, Kindle isn't likely to be more than a slice of the tablet market. But a massive, global consumer base isn't everything. The Kindle ecosystem will account for 11% of Amazon's total revenues this year, according to Morgan Stanley, including revenues from digital content streaming and downloading, app purchases, and advertising revenues. Amazon Prime subscriptions are another key source of Amazon revenue, and Kindle Fires encourage subscriptions because subscribers receive free unlimited video streaming and e-book borrowing. Morningstar estimates that there will be more than 10 million total Amazon Prime subscribers this year. Amazon's platform is in a major global expansion phase: Earlier this year, Amazon began selling high-end Kindle Fire models in 170 countries and brought the Amazon Appstore online in 200 countries.